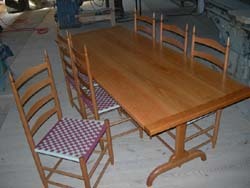 Although we make furnishings in many different styles our focus is on shaker chairs. This light but sturdy American classic was developed by the shakers over 200 years ago is a statement of simplicity and natural beauty. All chairs are made to order and can be customized to suit your tastes. A wide variety of woods, stains, and finials can be selected to match any décor or setting. The shaker tape seats are hand woven for a seat that is durable, comfortable, and colorful. Seats may be woven in one of several patterns available. A good set of chairs is complemented by a fine table.